For other uses, see Lysimachia (disambiguation). 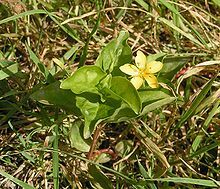 Lysimachia (/ˌlaɪsɪˈmeɪkiə/) is a genus consisting of 193 accepted species of flowering plants traditionally classified in the family Primulaceae. Based on a molecular phylogenetic study it was transferred to the family Myrsinaceae, before this family was later merged into the Primulaceae. Lysimachia species often have yellow flowers, and grow vigorously. They tend to grow in damp conditions. Several species within Lysimachia are commonly called loosestrife, although this name is also used for plants within the genus Lythrum. The genus is named in honor of Lysimachus, a king of ancient Sicily, who is said to have calmed a mad ox by feeding it a member of the genus. Lysimachia species are used as food plants by the larvae of some butterflies and moths, including the dot moth, grey pug, lime-speck pug, small angle shades, and v-pug. Bees of the genus Macropis are specialized to pollinate oil-producing Lysimachia plants. These bees use exclusively Lysimachia floral oils for building their nests and provisioning cells. Lysimachia floral-specific chemicals are strong attractors for Macropis nuda and Macropis fulvipes bees that are seldom found in other plant genera. Several fossil seeds of Lysimachia sp. have been described from middle Miocene strata of the Fasterholt area near Silkeborg in Central Jutland, Denmark. †Lysimachia nikitinii seed fossils have been collected from Pliocene strata of south eastern Belarus. The fossils are most similar to seeds of the East Asian Lysimachia davurica. ^ "The Plant List, Lysimachia". ^ M. Källersjö, G. Bergqvist & A. A. Anderberg (2000). "Generic realignment in primuloid families of the Ericales s. l.: a phylogenetic analysis based on DNA sequences from three chloroplast genes and morphology". American Journal of Botany. American Journal of Botany, Vol. 87, No. 9. 87 (9): 1325–1341. doi:10.2307/2656725. JSTOR 2656725. PMID 10991903. ^ Schäffler; Dötterl (February 2007). "Flower Scent of Floral Oil-Producing Lysimachia punctata as Attractant for the Oil-Bee Macropis fulvipes". Journal of Chemical Ecology. doi:10.1007/s10886-006-9237-2. PAF - Lysimachia clethroides - Duby. This page was last edited on 13 December 2018, at 22:44 (UTC).